BOSTON, MA--(Marketwired - April 05, 2016) - Bpm'online, whose process-driven CRM for marketing, sales and service helps over 6,500 organizations win more customers, has been named as a Leader in the CRM Value Matrix for the second year in a row. Nucleus Research noted that bpm'online has been recognized as a Leader in the most recent Value Matrix for demonstrating continued investment in functionality and usability. 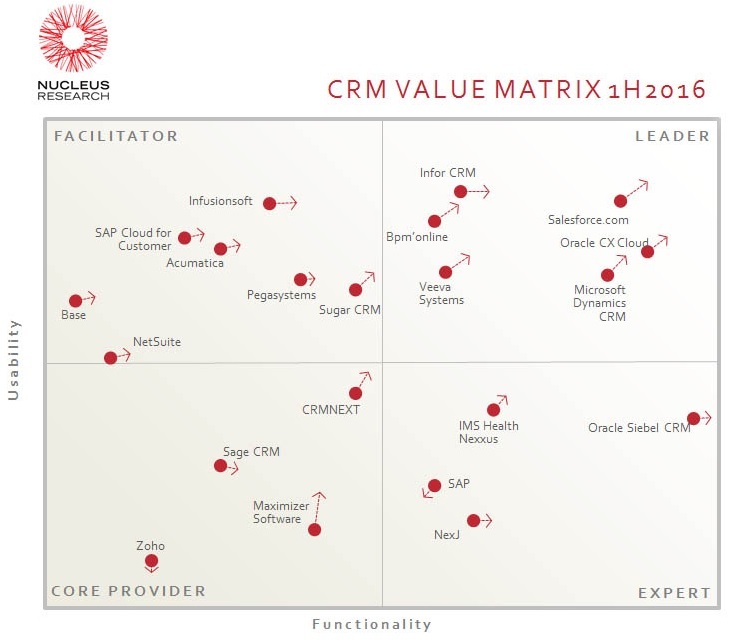 The CRM Value Matrix 1H 2016 evaluated the world's most innovative CRM software providers for their usability and functionality capabilities -- the two key factors that indicate a systems' ability to deliver a fully coordinated customer experience for its users. Being named a leader in the report, bpm'online validated its position in the CRM Value Matrix with its recently updated platform that equips businesses with the necessary tools to boost loyalty and build trusted long-lasting relations with their customers. Bpm'online is also empowered with a set of out-of-the-box best practice processes that can be altered on the fly which allows for streamlining customer-facing operations as well as managing a complete customer journey. "Increased agility for the user is a focus of bpm'online's latest release and we expect further investment to be in tools that allow users to unlock even more productivity," said Rebecca Wettemann, Vice President at Nucleus Research. "With back-to-back releases to their platform in consecutive Matrices, bpm'online's investment in improving users' experience and delivering new tools demonstrates focus on important areas that, if continued, should improve its position in future editions of the Value Matrix." "As organizations are looking for genuinely agile solutions and greater user productivity, bpm'online's focus on creating cutting-edge CRM products helps more businesses gain a competitive edge in the ever-changing cloud era. We believe that our positioning in the Leaders quadrant of Nucleus Research's Value Matrix for the second year in a row is a result of our continued willingness to innovate as well as a clear strategic direction aimed at helping businesses boost revenue and customer loyalty," said Katherine Kostereva, CEO and Managing Partner at bpm'online. Request access to a full report from NucleusResearch.com. Nucleus Research is a global provider of investigative, case-based technology research and advisory services that provide real-world insight into maximizing technology value. Bpm'online is a global vendor of process-driven CRM for marketing, sales, and service. The beauty and the core value of bpm'online products is the agility to change processes faster than ever and align marketing, sales and service on a single platform. Users love bpm'online's engaging interface with a social look and feel, that is free from redundant information and keeps them focused on what's relevant. Today, the company employs 600+ experts and serves over 6,500 customers worldwide.